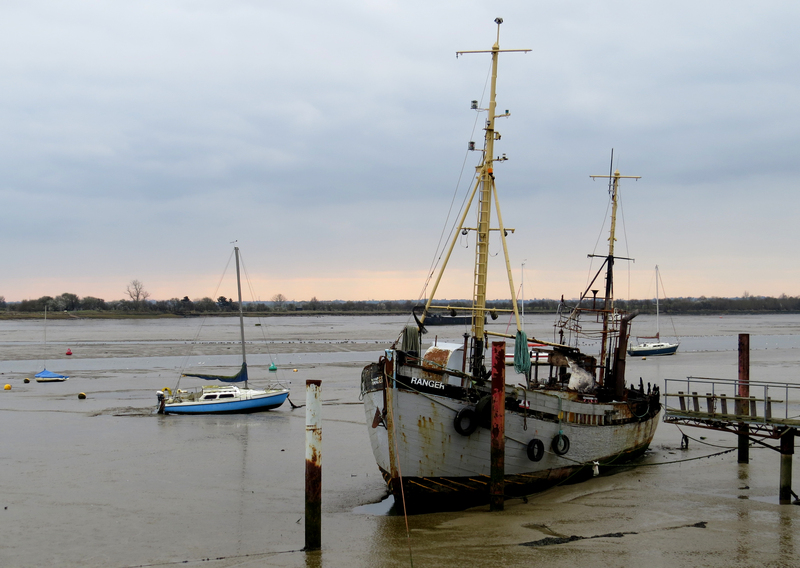 We spent a few days in late February at my step-daughter Anita’s place in Maldon, Essex. Regular readers of this blog may remember that a wildlife cruise I had booked around the Russian Far East was cancelled at short notice in 2015. 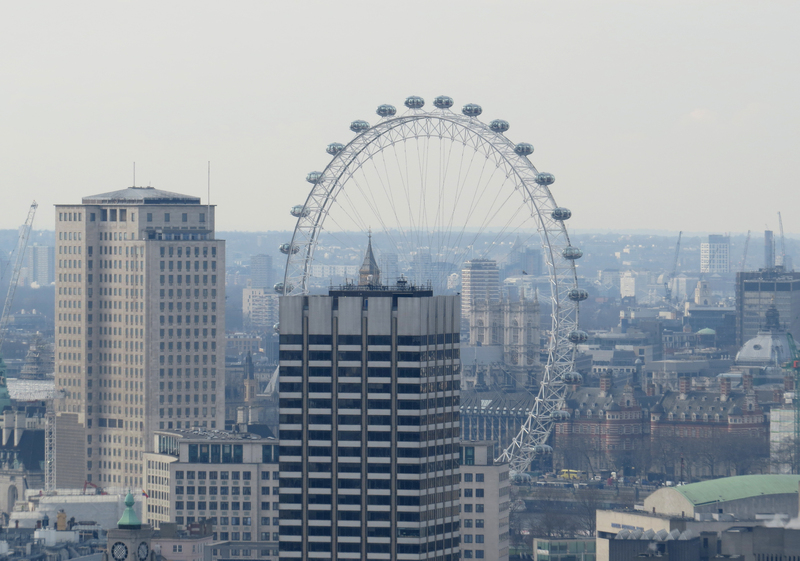 Well I’ve rebooked for this year, so that means a trip to London to be fingerprinted for my Russian visa (even though they have my fingerprints on file from 2015!). Rather than go to London from Poole we opted to wait until we were in Essex as that was a much shorter journey also we could spend the rest of the day sightseeing. 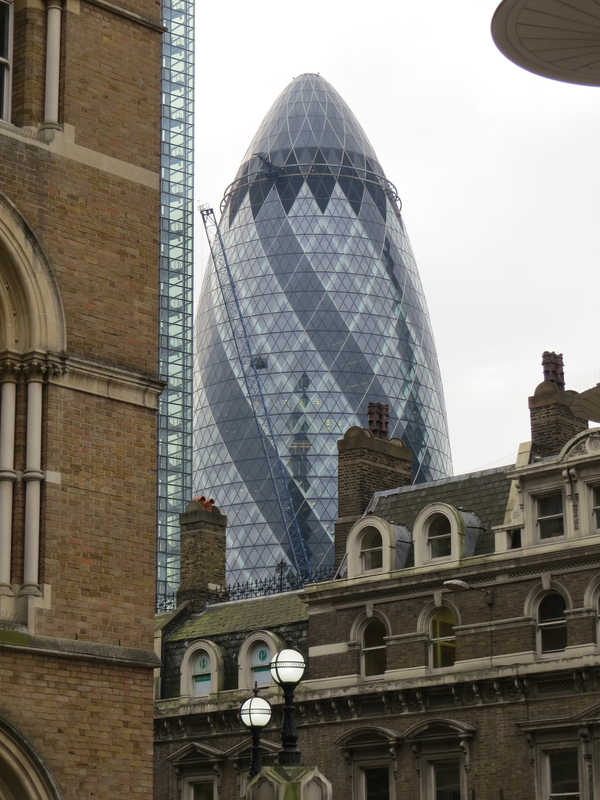 We caught the train from Chelmsford to Liverpool St Station and were surprised to find how close we were to ‘the Gherkin’. 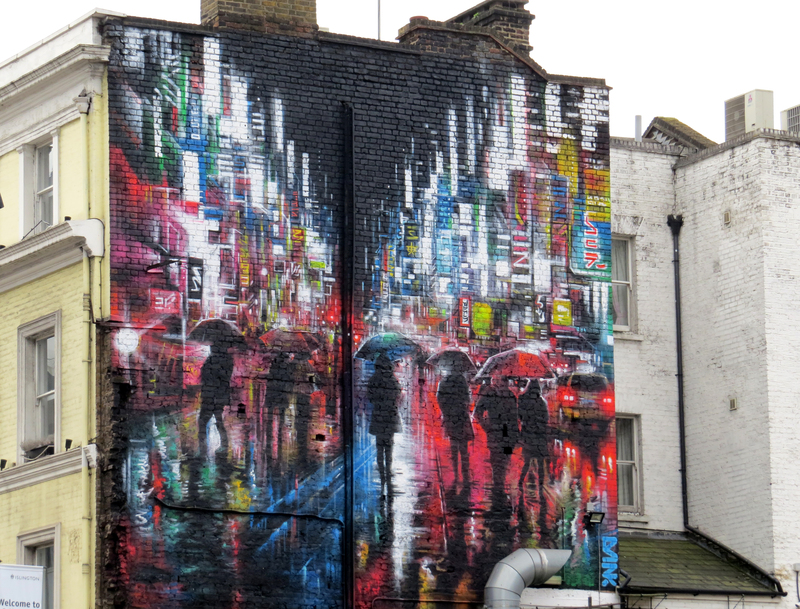 We walked to the Russian visa centre in Gee Street, passing some interesting murals on the way. You have to say one thing about the Russian visa system, once you have spent a day filling in the forms and have actually got to the visa centre, the process only takes a few minutes, so we were done by 0930 and had the rest of the day to ourselves. We chose to go to St Paul’s Cathedral which was in within walking distance. 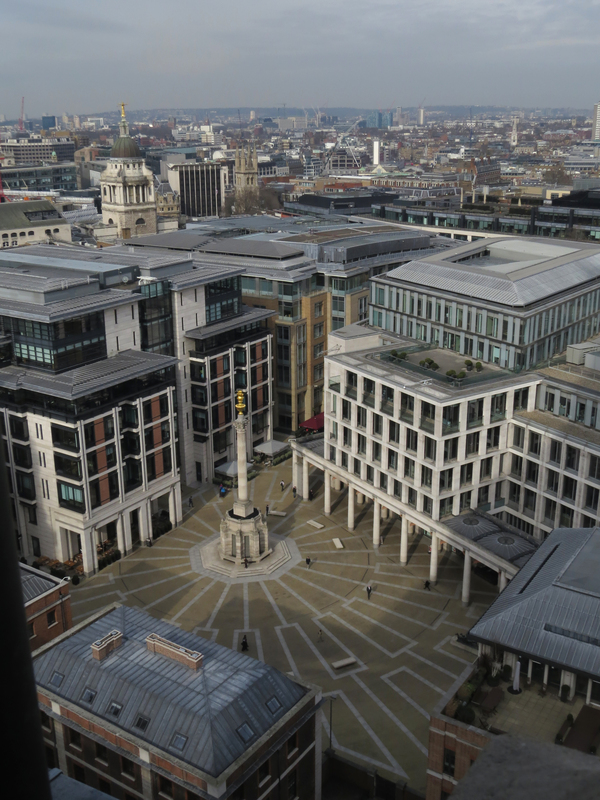 This photo was taken later in the day from Ludgate Hill. Between the early 7th C and 1666 at least four different St Paul’s Cathedrals stood on the site, the fate of the first is unknown, but numbers two and three were destroyed by fire in 962 and 1087 respectively. 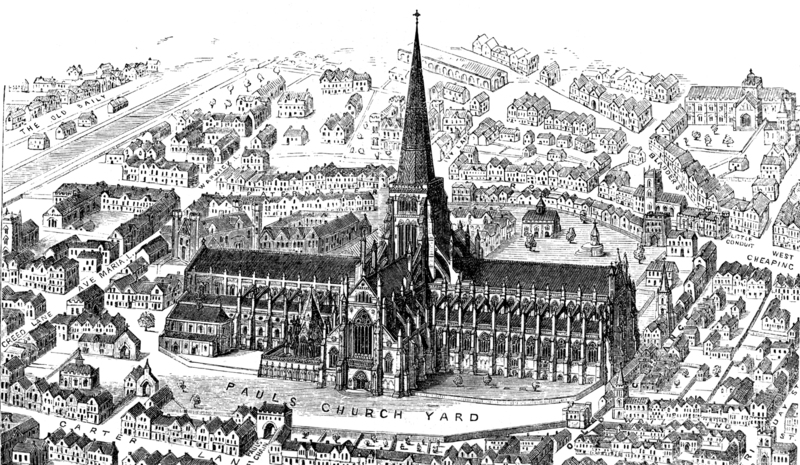 This drawing of the old cathedral as it appeared around 1561 was taken from Wikipedia. The fourth St Paul’s was completely destroyed in the Great Fire of London in 1666. The current cathedral with its iconic dome was built by Christopher Wren starting in 1669 and was consecrated in 1708. The cathedral was almost destroyed when a bomb hit it during WWII. 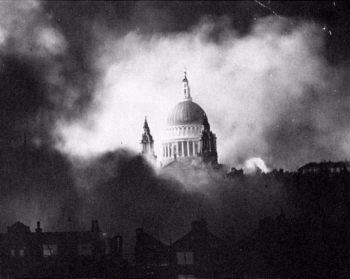 This photo of S Paul’s taken on 29/12/40 by Herbert Mason during the blitz has to be one of the most famous photographs ever taken. Copied from Wikipedia. Photography within the cathedral is prohibited so I have taken this photo from www.grouptravelorganiser.com. Looking eastwards from the nave to the choir and the high altar. 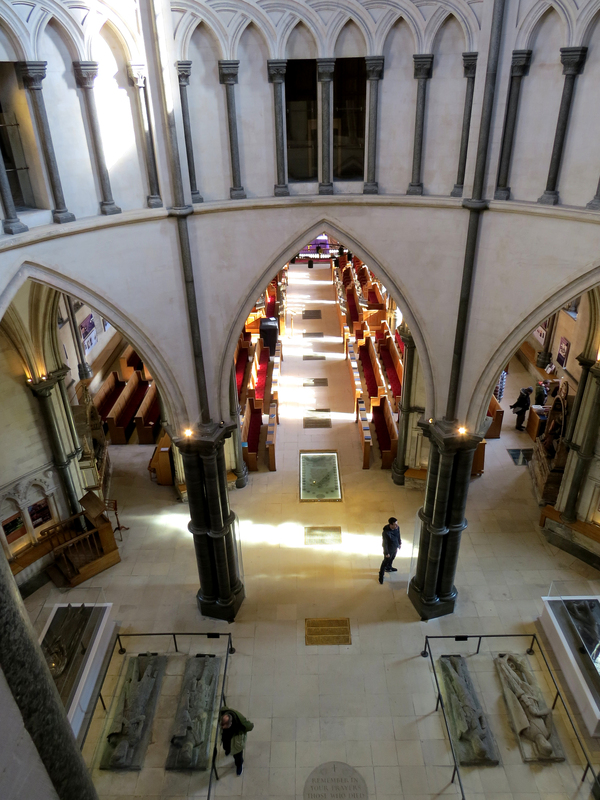 This stunning fish-eye view was taken from www.hdrone.com and shows the dome and the nave. The spire above the dome is 365 feet tall, one foot for every day of the year. Spreading the load of the dome was a problem, Wren’s solution was to create a dome within a dome supported by the brick cone seen in the diagram. It is possible to continue up from the Whispering Gallery to the lower ‘Stone Gallery’ and then up a narrow spiral staircase between the brick cone and the outer dome to the ‘Golden Gallery’. Picture from Wikipedia. One place in the cathedral where you are allowed to take photos. Here the brick cone supporting the weight of the outer dome can clearly be seen. 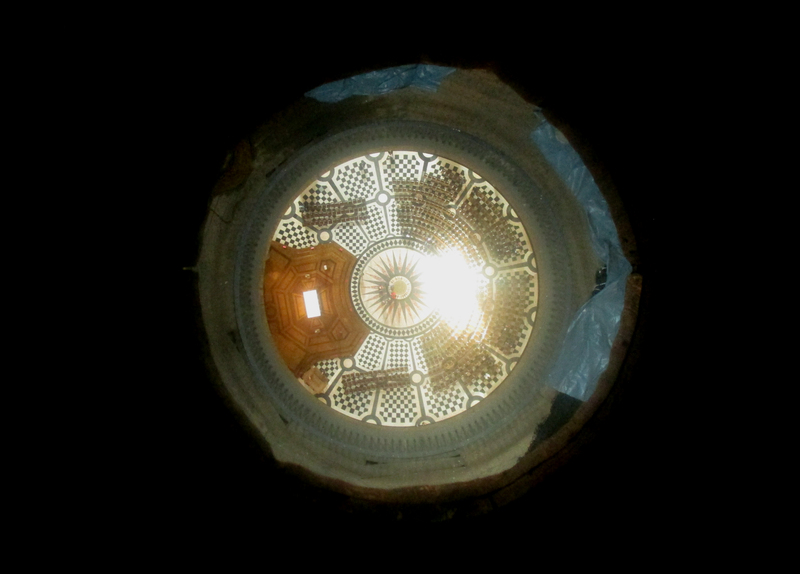 At the top of the inner dome you can look through an oculus to the floor of the nave far below. 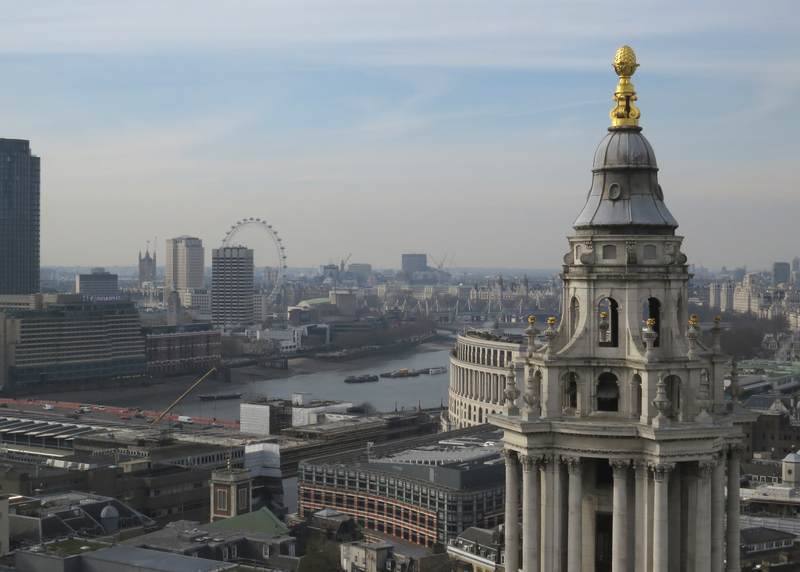 From the Stone Gallery and the Golden Gallery you get a wonderful view over London. Light conditions changed rapidly hence the lack of clarity in some of the following. 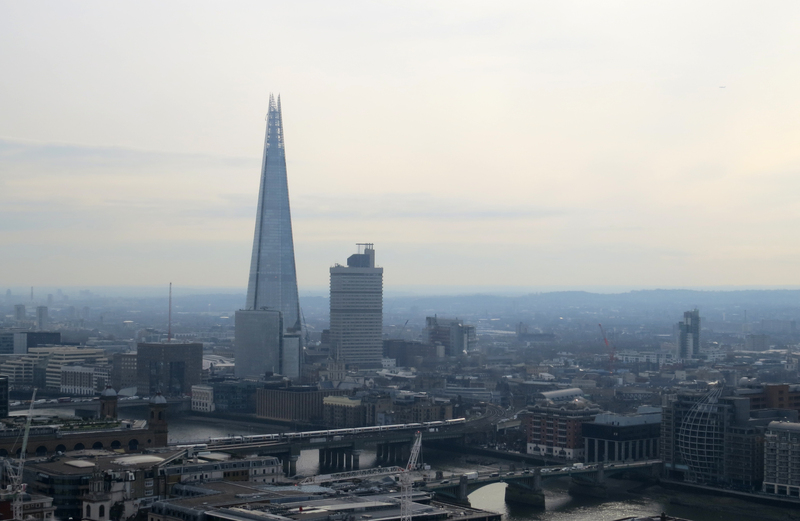 At 306m The Shard is Britain’s tallest building. 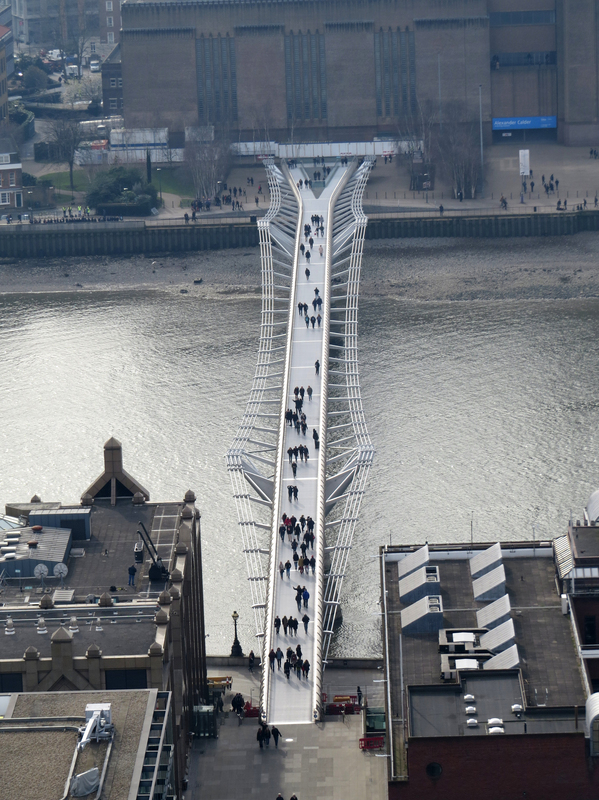 Unacceptably wobbly when first opened – The Millennium Bridge. 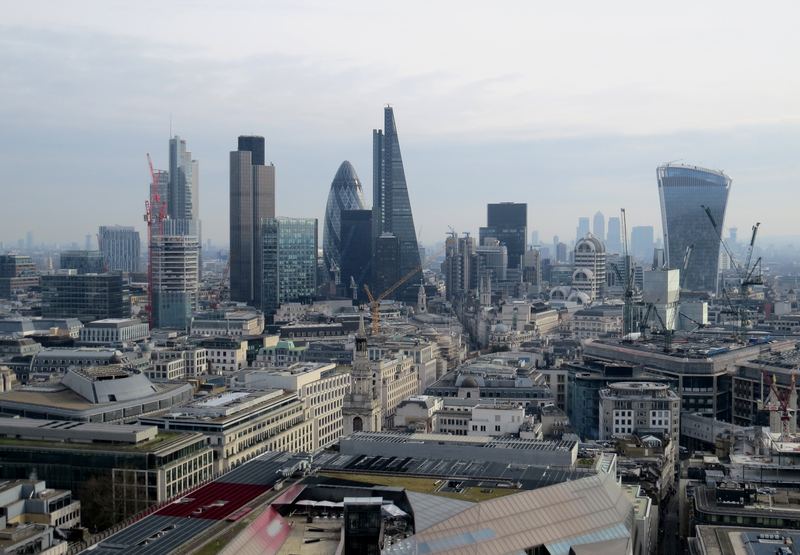 Looking east towards the Gherkin and other tall skyscrapers. Tower Bridge is just out of sight to the right of the photo. 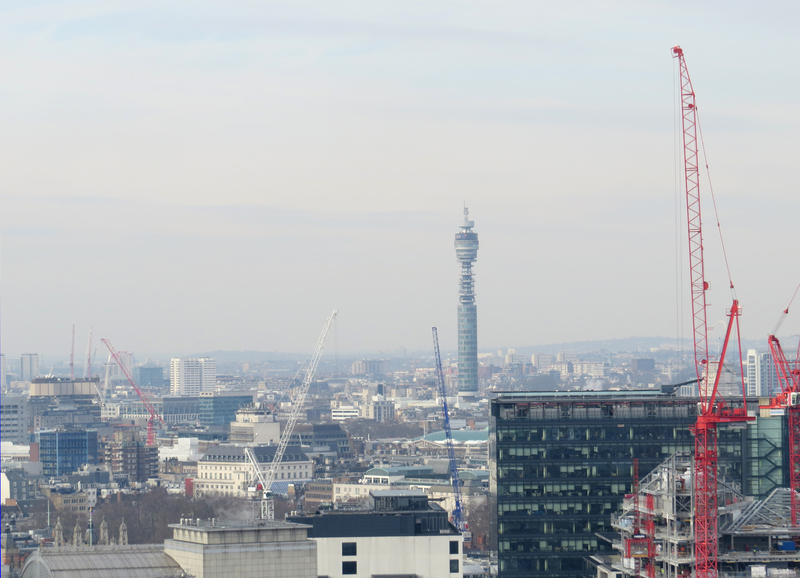 Looking north-west to the Post Office Tower. 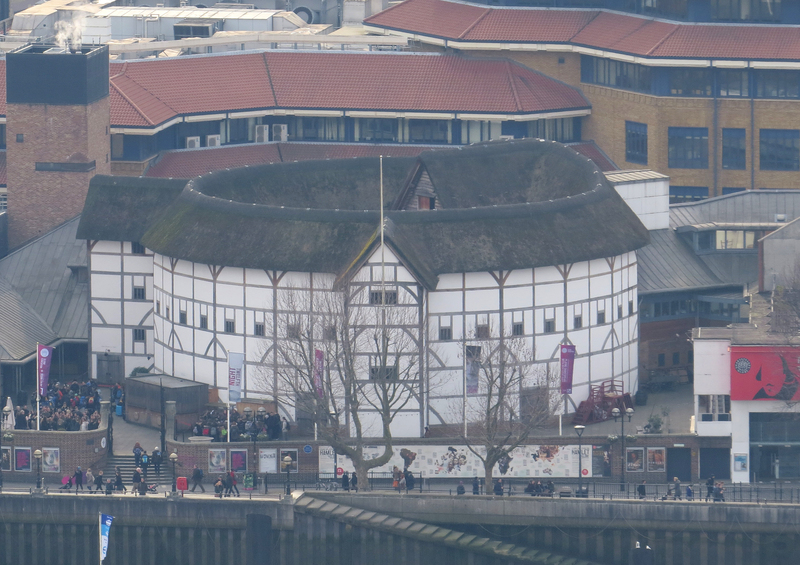 On the other side of the Thames, The Globe, a reconstruction of Shakespeare’s famous theatre. 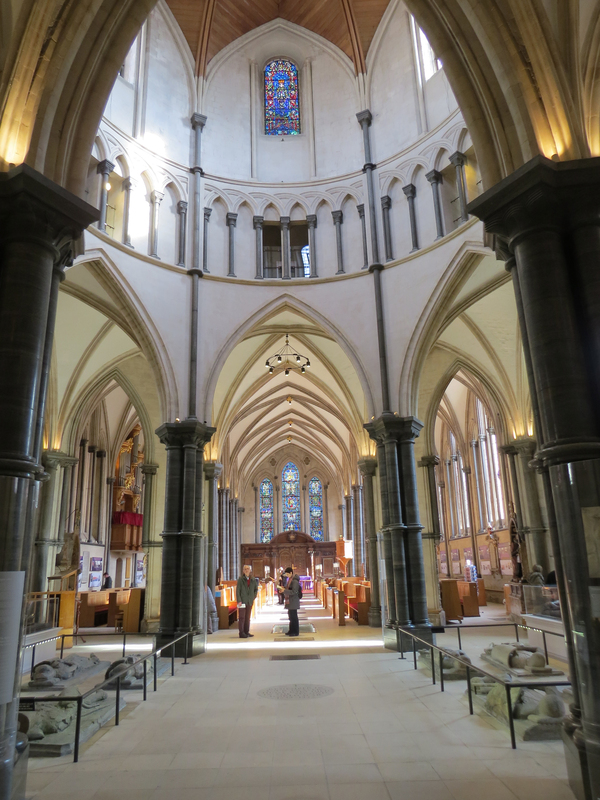 After St Paul’s and some lunch we walked to the nearby Temple Church. 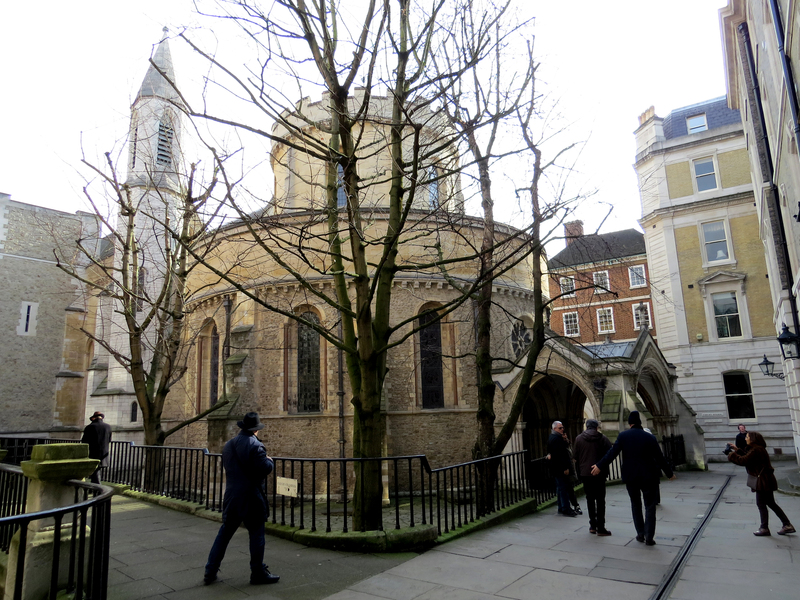 Whilst hardly matching the magnificence of St Paul’s, the Church has an interesting history. 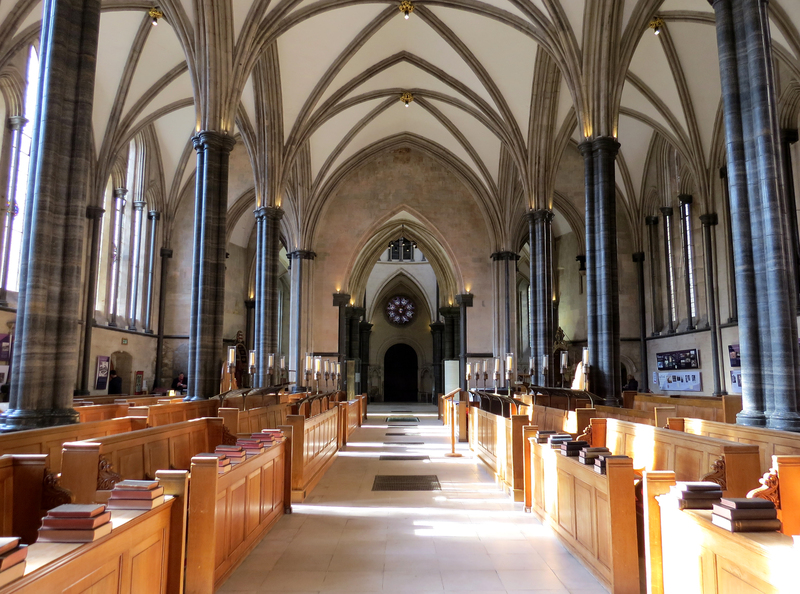 Built in the 12th C by the Knights Templar as their English HQ, in the reign of King John it served as the Royal Treasury, making the Knights Templar early examples of international bankers. The Knights Templar were originally formed to protect Christian pilgrims on their visit to Jerusalem and Solomon’s Temple after the first crusade in 1099 . They grew to be the wealthiest and most influential of the Christian military orders. Although the peak of their power only lasted for 200 years, they bankrolled much of Christendom (inventing aspects of the modern system of banking) and became a feared fighting force in subsequence crusades. Modern day stories or should I say myths, involve the Templars in the whereabouts of the Holy Grail, the Ark of the Covenant and the origins of Freemasonry and they have of course been highlighted in such influential books as the ‘The Holy Blood and The Holy Grail’ and the Templar Church itself featured in the film ‘The Da Vinci Code’. We hurried back to Maldon in Essex as we knew that Anita’s husband John and his brother-in-law Gavin wanted to go out for a drink as it was Gavin (R) and his wife Lois’ wedding anniversary. 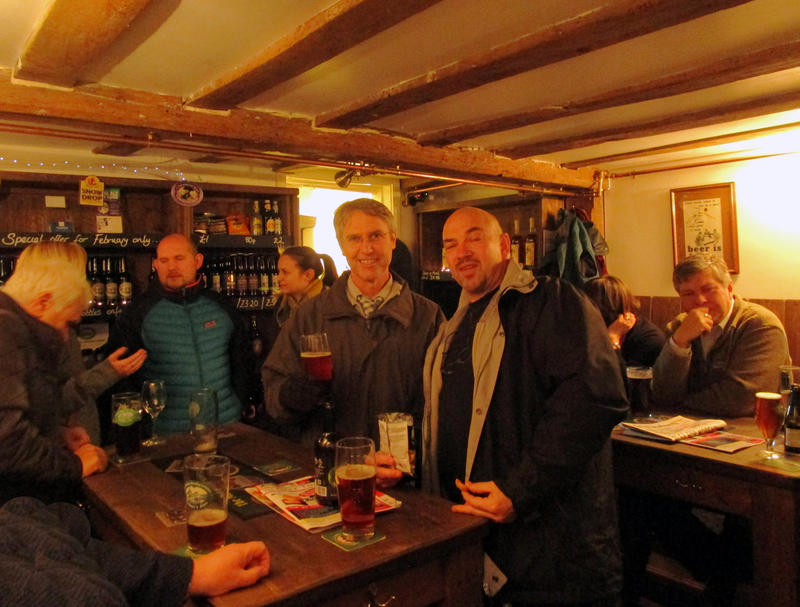 Some of the pubs in Maldon are more like someone’s front room than a typical boozer. This one in particular is smaller than the typical living room, you have to wait for someone to leave before you can squeeze yourself in. 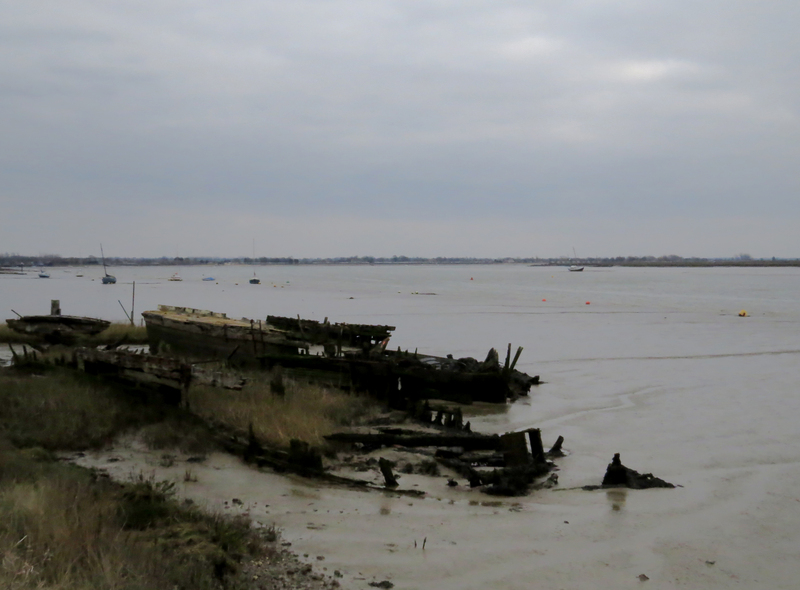 On the Saturday I popped out to the nearby Blackwater estuary to do some birding but a strong easterly wind was blowing and it was bitterly cold. 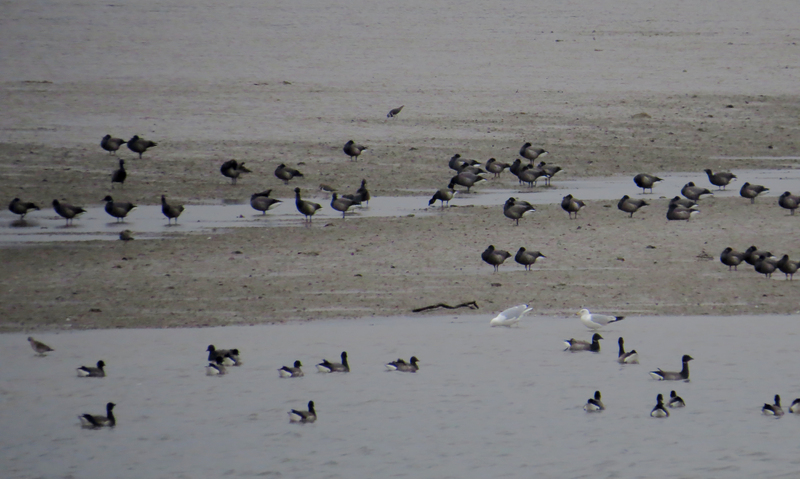 The tide was coming in pushing the Brent Geese towards to me but they still remained too far away for good photos. 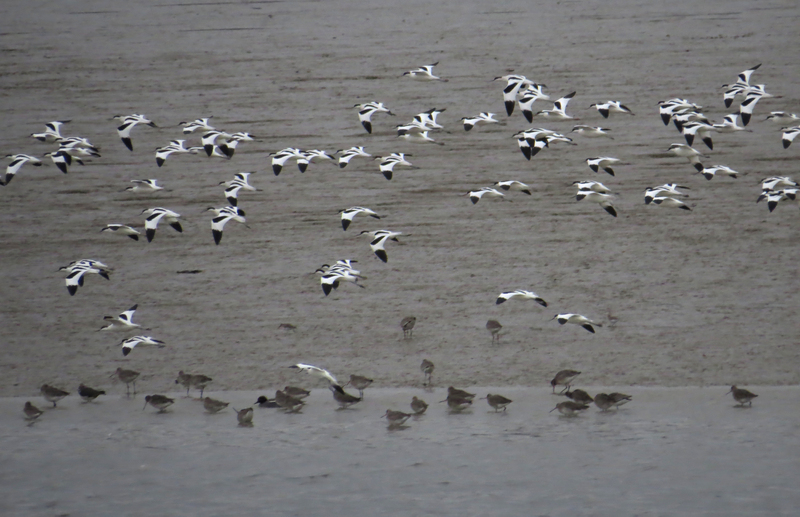 A flock of Avocets in flight with Black-tailed Godwits feeding on the water’s edge. 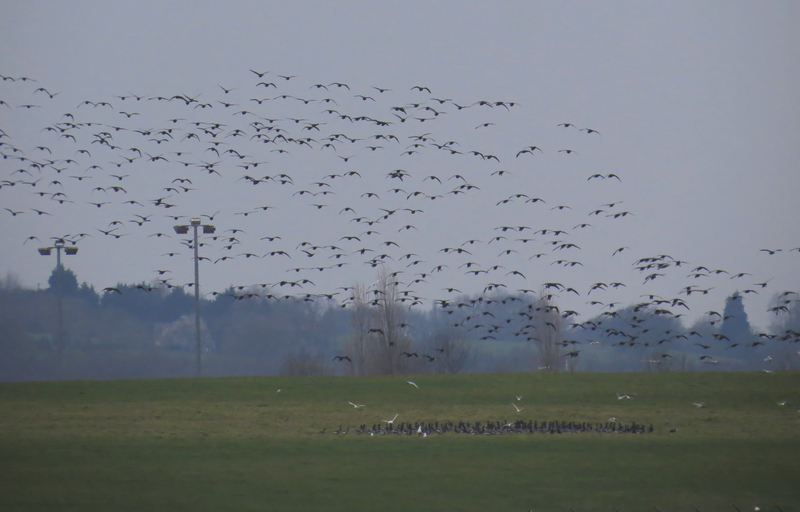 As the tide rose further many of the geese headed for the nearby fields. To make matters worse I had left my gloves back at John and Anita’s so when I heard that Margaret and Anita were enjoying tea and cakes at a nearby cafe I abandoned the birds for a bit of warmth. 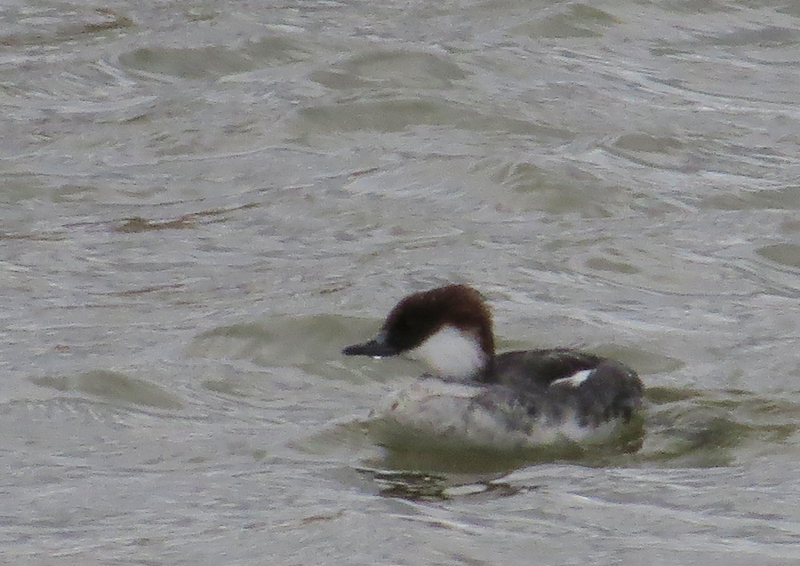 On Sunday I drove to Abberton Reservoir, a 30 minute drive to the north. 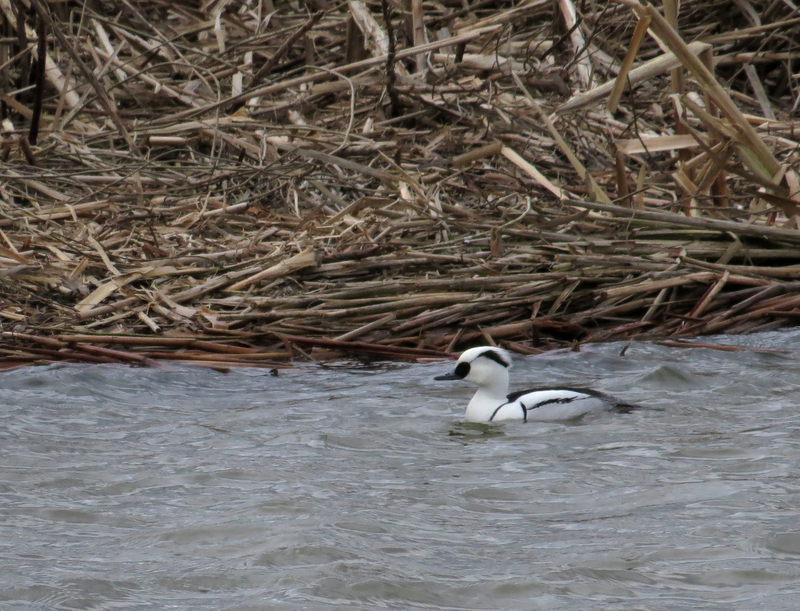 I had not expected too much, so I was pleased to see three female/immature Smew. 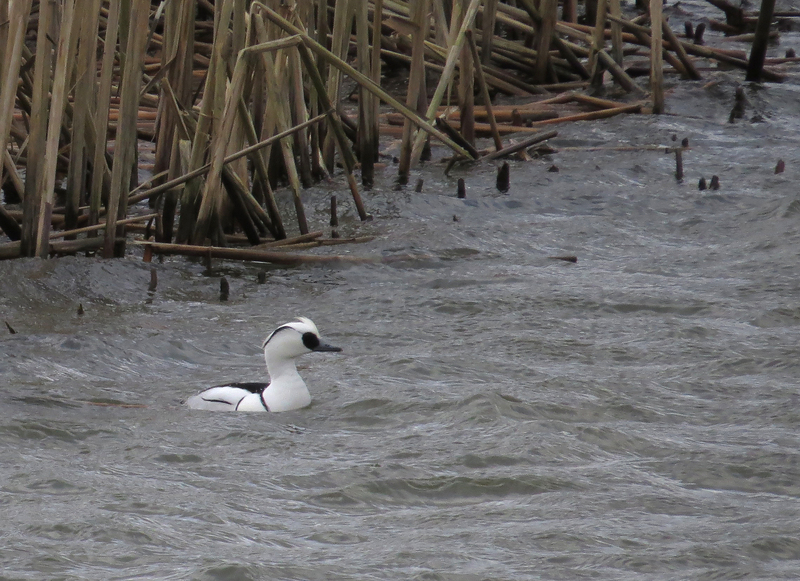 We have had a female Smew in Holes Bay near to where I live in Poole but its been a long time since I saw a drake in the UK, well 2004 to be precise. The beautiful drakes seldom turn up west of London except in very hard weather when more easterly lakes and reservoirs freeze up, so I was delighted to see two of them here. 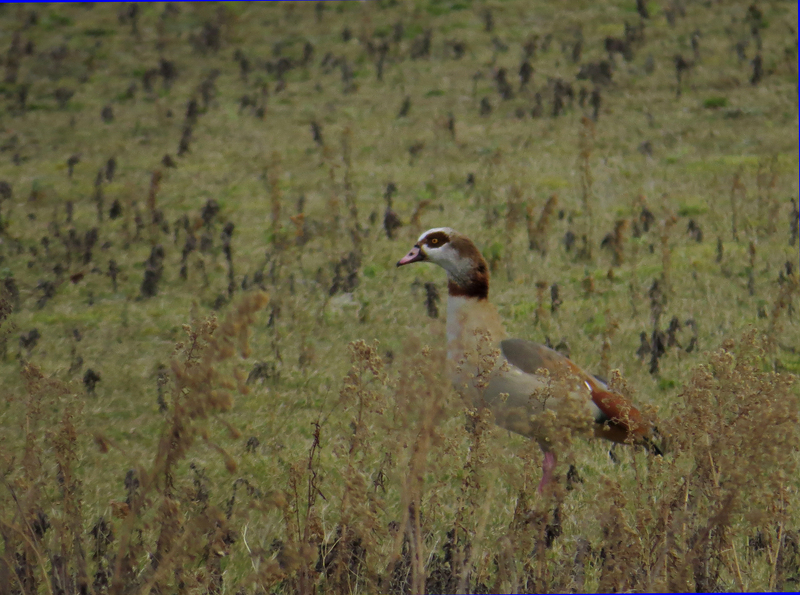 Less exciting was this Egyptian Goose, an introduced species that is slowing spreading westwards from it’s East Anglian stronghold. It is now quite numerous in the Avon Valley on the Dorset /Hampshire border but is still rare around Poole. So on Sunday evening we said goodbye to the family and headed for Cambridgeshire to stay with my old friend Jenny. 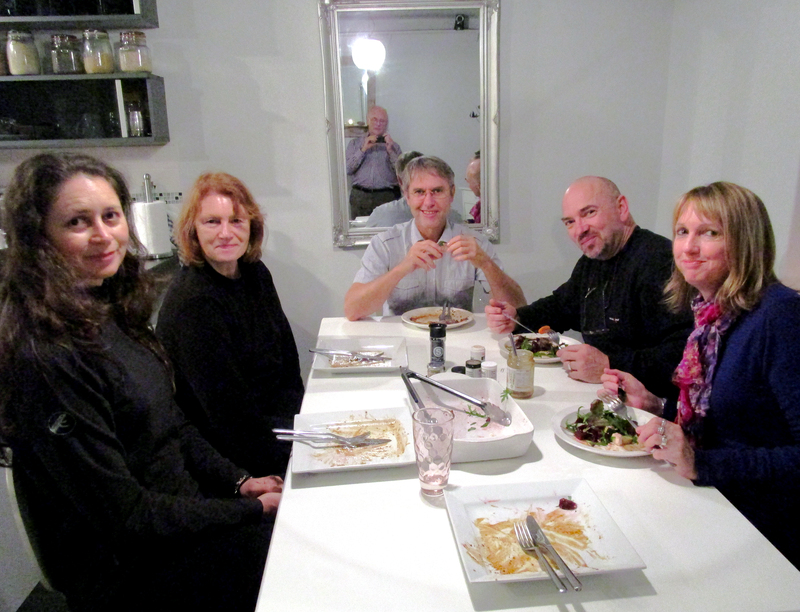 L-R Anita, Margaret, John, Gavin and Lois, with me making a guest appearance in the mirror! I have known Jenny since 1972 when she came to Leeds University to study for a PhD. Along with three others we shared a house from 1973-76 and have kept in touch since. Now that we visit Essex on a regular basis, calling in to see Jenny has been so much easier. 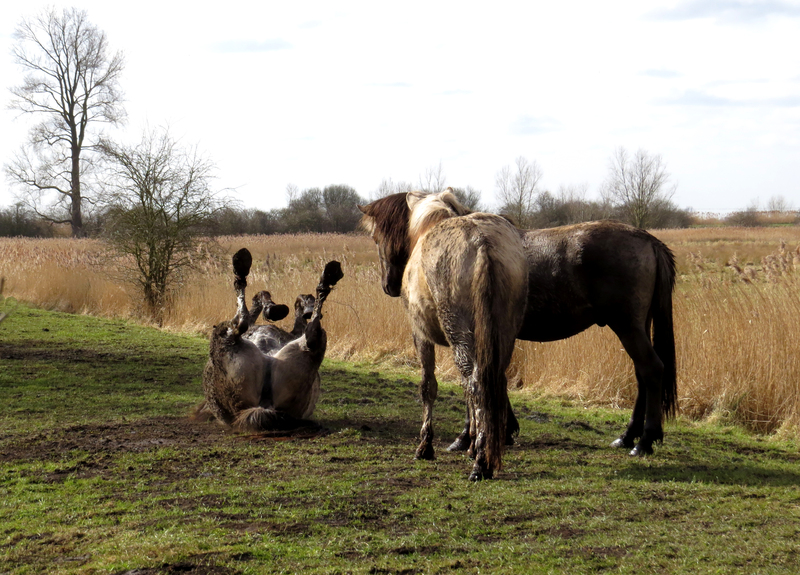 Jenny works as a volunteer at Wicken Fen, in Cambridgeshire, mainly doing botanical work and demonstrating wildlife to visiting children The core part of Wicken Fen is a fragment of the original fen habitat that once covered much of East Anglia. With almost all of the fens drained and turned into agricultural land, there is a move now to recreate some large areas of former fen for wildlife. Areas like this on the edge of tWicken Fen have been bought up and are slowly being converted back to their former glory. 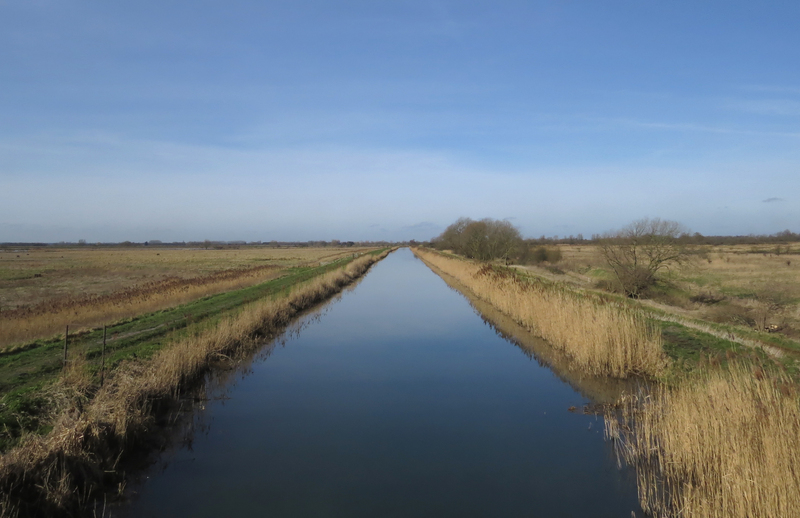 The National Trust has a long term plan to restore an area of fen stretching from Wicken Fen in the north to the outskirts of Cambridge, a distance of 25 miles, although they have set a time span of 100 years in order to achieve that. The marshes are grazed by Konik horses from Poland, morphologically and genetically closest to the Tarpan, the original wild horse of Europe. Tarpans went extinct in 1909 although they were probably extinct in the wild for some time before that. 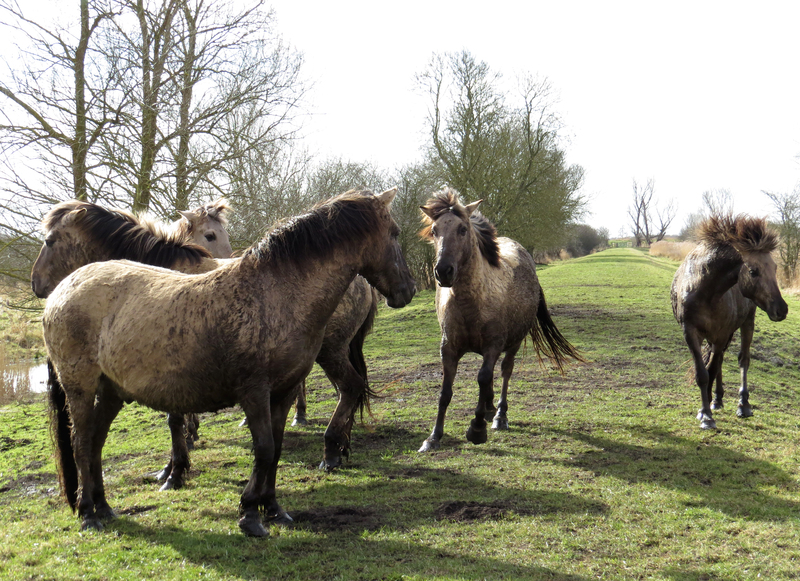 Their ability to survive unaided in wetland areas and lightly graze the area to deduce invasive vegetation makes them ideal for the recreation of lost fen habitats. As nice as Wicken was, at this time of year it wasn’t great for birds, so after lunch we headed north to the border of Cambridgeshire and Norfolk to look for wild swans. 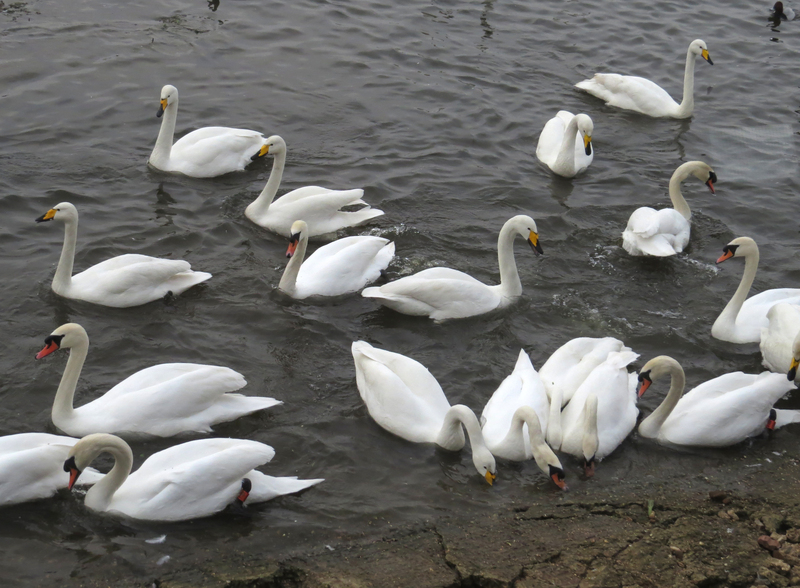 From wild horses to to wild swans. In the fields around the WWT reserve at Welney large numbers of Whooper Swans and a much smaller number of Bewick’s Swans were grazing. 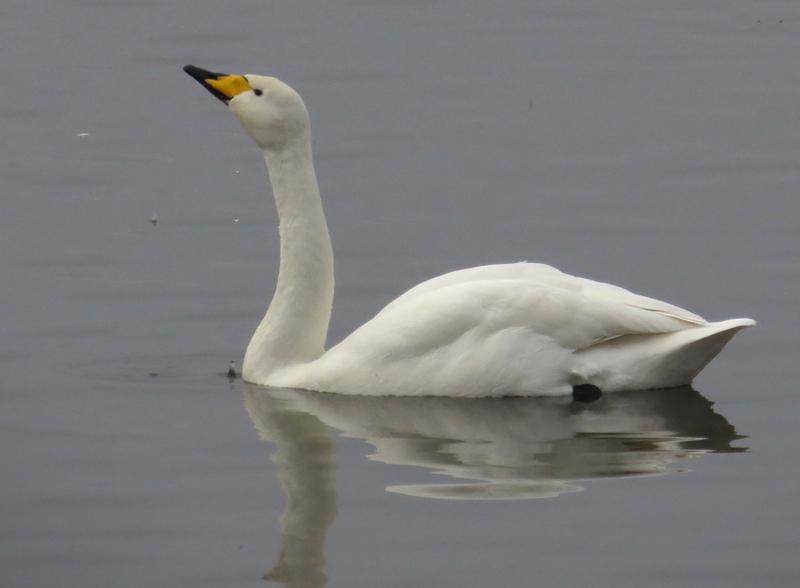 We used to get flocks of 100+ Bewick’s in Dorset and just over the border in the Avon valley, but these days they are very rare, just one has turned up this winter and that was only after we visited Welney. 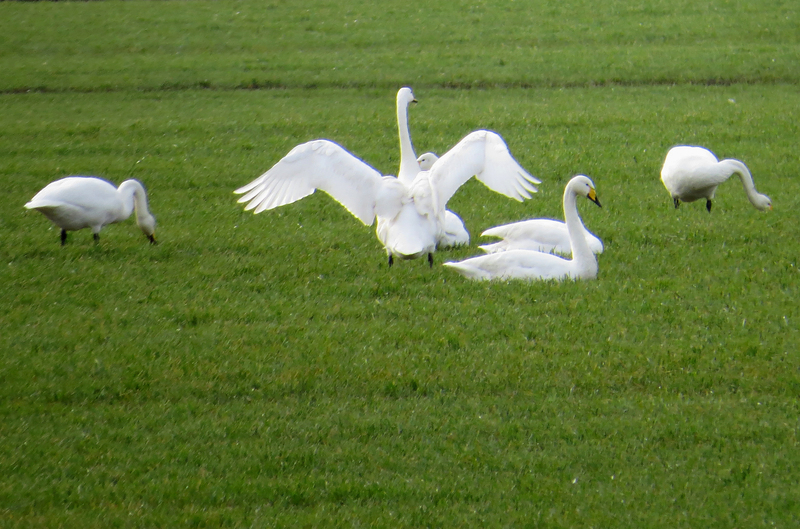 Whooper Swans have always been rare in the south. 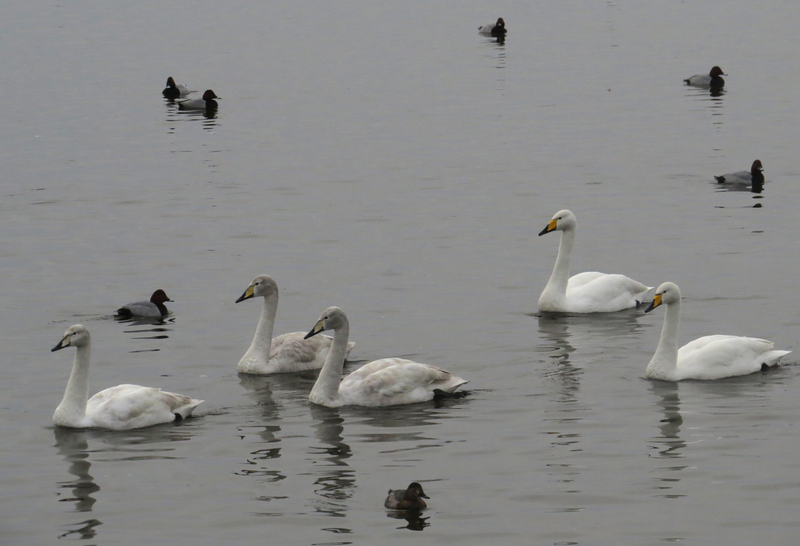 All of these birds are the larger Whooper Swans from Iceland with the triangular yellow mark on the bill. The smaller Bewick’s from arctic Russia have a rounded yellow patch on the bill. Bewick’s numbers have decreased noticeably across the UK in recent years, this may be due to climate change allowing them to winter on the (now much milder) continent ,but hunting on their migration routes must be a contributing factor. 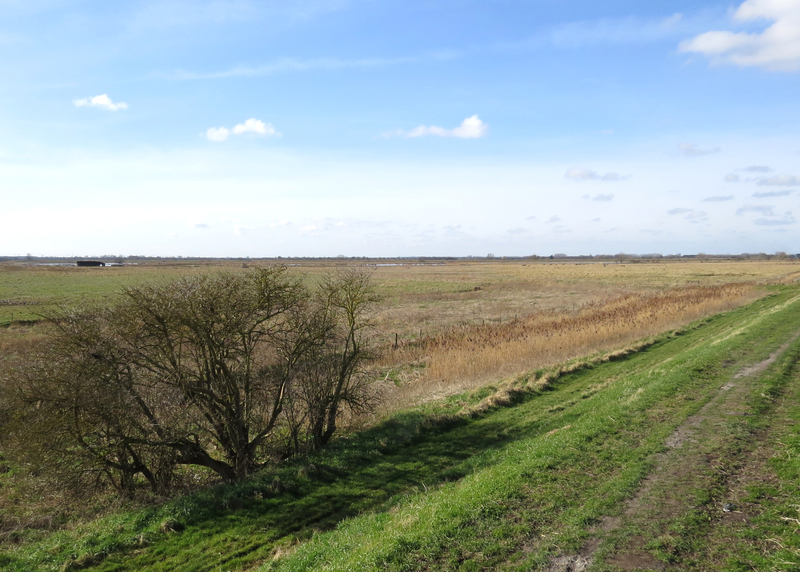 The Welney reserve is part of the Ouse Washes, a twenty mile long embanked area where water from the River Ouse is pumped in winter to prevent the surrounding farmland flooding. This results in a haven for wildfowl in the winter and grazing marshes favoured by breeding waders in summer. This type of ‘sacrificial land’ could well be adopted in other flood prone areas, rather than the current system of channeling the flood water away ASAP to the detriment of those downstream. Around the margins of the flood were many Lapwings, Golden Plovers and the odd Ruff, whilst in the open water we saw many Mute and Whooper Swans and other wildfowl. 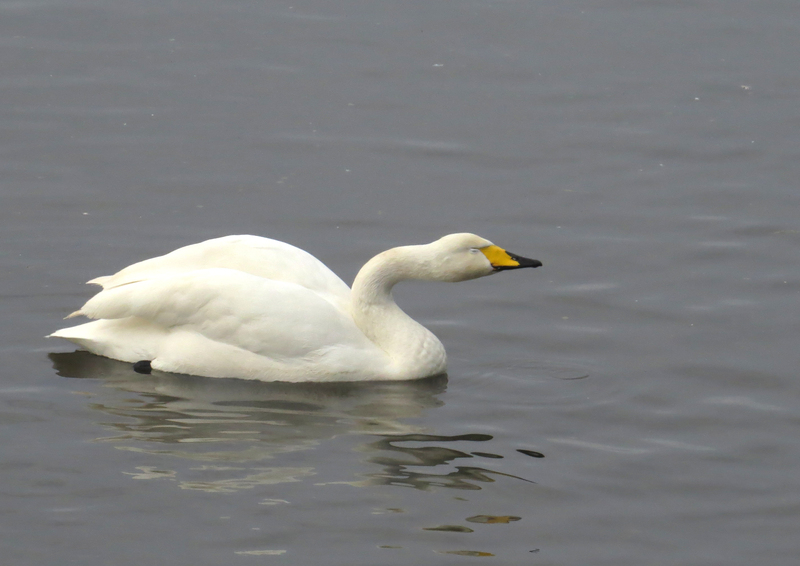 The triangle yellow patch on the bill which separates this Whooper Swan from the smaller Bewick’s can be seen well in this photo. 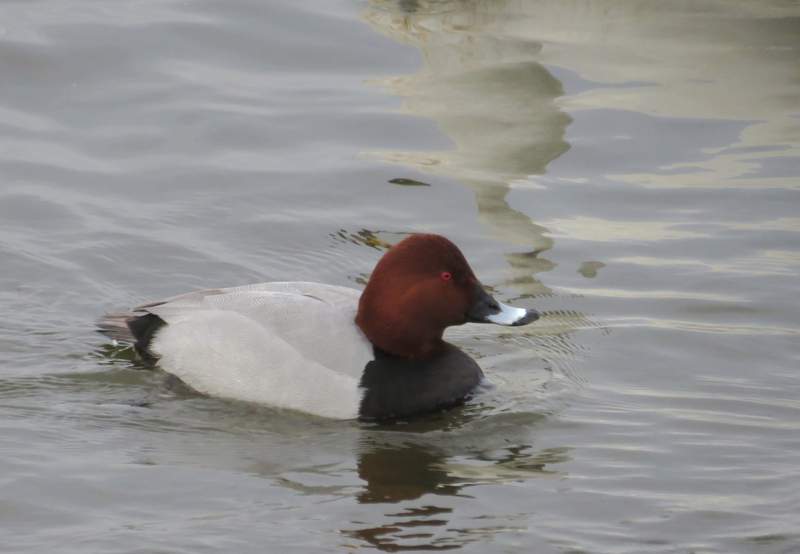 Among the many ducks on the reserve where good numbers of (mainly male) Pochard. This species has declined in Dorset in recent years, probably because they are now wintering father east than before. 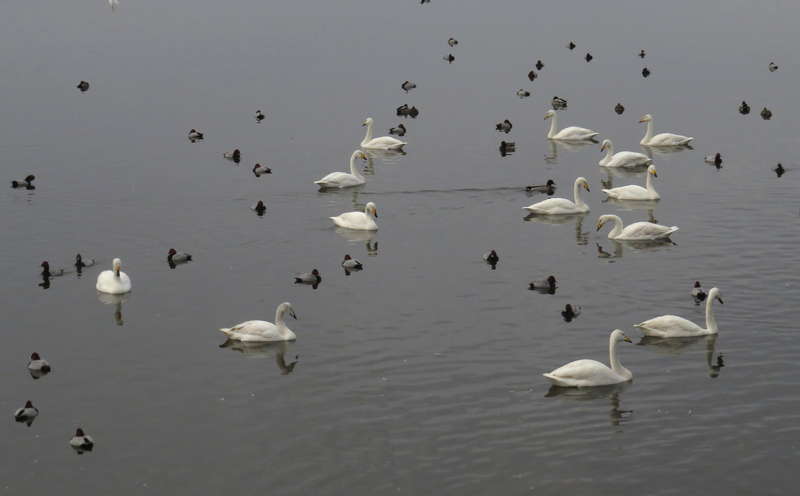 At 1530 the swans are fed and the Whooper and Mute Swans come right up to the hide giving excellent views. There was supposed to be both White Stork and Great White Egret on the reserve but they could not be found during our visit. Whooper Swans migrate from Iceland as a family unit and remain together over the winter. Here an adult pair are accompanying their four cygnets (one is out of shot). We returned to Jenny’s that evening and headed home the following day with nothing more exciting than a Red Kite seen on route. As before our trip to East Anglia was to see family and friends but its great to combine this with birding in this outstanding part of England.